A blizzard paralyzed the East, temperatures dropped to zero, and the storms even brought Bowling Green down to a teeth-chattering 3 degrees. 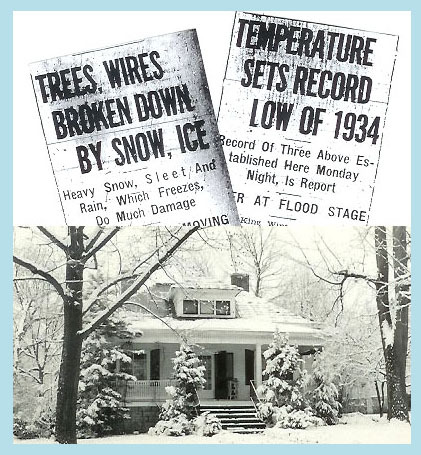 It was February 1934, a month of wintry weather for the record books. Martha also related the attempt of a friend and her husband to pay a visit on that “icy Sunday,” thwarted because “nobody could get up the hill on Main Street.” A full week later, they were still trying to pass along roads filled with tree limbs and other debris, leaving their car “mired to the hubs.” After an extraction that took two hours, they suffered the same fate the next day . . . and the next. Fortunately, wrote Martha, a thaw was on the way. As the temperature climbed to a balmy 38 degrees, the retreating snow started to make “big noises leaving the roof of the house and sliding down the gutters,” closing another memorable chapter in Bowling Green’s winter history. Martha Potter’s letters are part of the Lissauer Collection in the Manuscripts & Folklife Archives section of WKU’s Special Collections Library. For other collections documenting weather and storms, search TopSCHOLAR and KenCat.